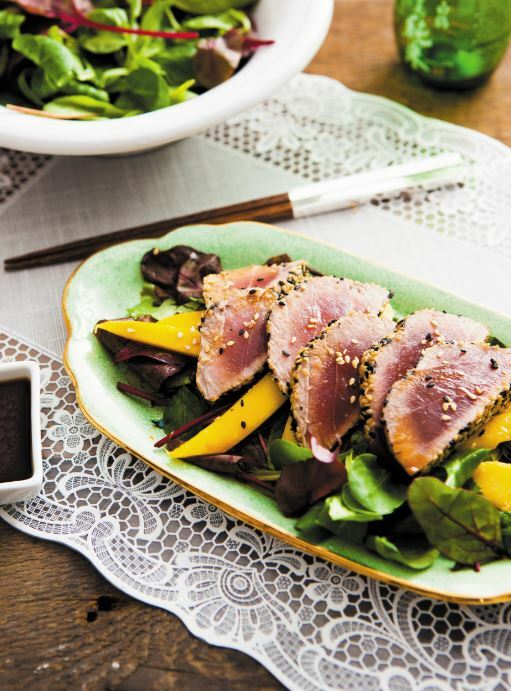 When making this recipe make sure to lightly sear the tuna as I truly believe tuna tastes better either raw or lightly seared. Once tuna is cooked it becomes tough and loses its flavour. This salad is particularly nice eaten while the tuna is warm, so don’t waste any time once it’s ready and try to eat it straight away. 1 Mix together the sesame seeds, salt and pepper on a flat plate. 2 Place the tuna on the plate and coat each side in sesame seeds. 3 Heat a little vegetable oil in a non-stick frying pan on a medium to high heat. 4 Place the tuna on the pan and sear each side lightly (less than 1 minute for each side). 5 Transfer to a chopping board and, using a sharp knife, thinly slice the tuna. 6 Place the mixed salad leaves on a serving dish along with the mango strips. 7 Carefully place the tuna slices on top. 8 Mix all the ingredients for the dressing in a bowl and, just before serving, pour over the salad.